1. A prior knowledge. Theory or past research may suggest a particular number of dimensions. 2. Interpret ability of the spatial map. Generally, it is difficult to interpret configurations or maps derived ill mere than three dimensions. 4. Ease of use. It is generally easier to work with two-dimensional maps or configurations than with those involving more dimensions. 5. Statistical approaches. 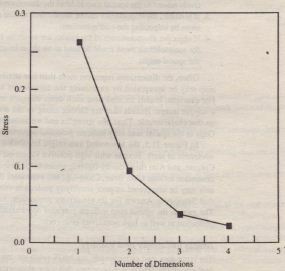 For the sophisticated user, statistical approaches are also available for determining the dimensional. Based on the plot of stress versus dimensional (Figure 21.3), interpret ability of the spatial map, and ease-of-use criteria. it was decided to retain a two-dimensional solution. 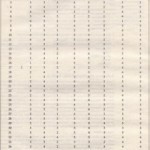 This is shown in Figure 21.4. It is worthwhile to point out some assumptions and limitations of MDS. It is assumed that the similarity of stimulus A to B is the same as the similarity of stimulus B to A. There are some instances where this assumption may be violated. For example, Mexico is perceived as more similar to the United States than the United Slates is to Mexico. MDS assumes that the distance (similarity) between two stimuli is some function of their partial similarities on each of several perceptual dimensions. Not much research has been done to test this assumption. When a spatial map is obtained, it is assumed that inter point distances are ratio scaled and that the axes of the map are multidimensional interval scaled. A limitation of MDS is that dimension interpretation relating physical changes in brands or stimuli to changes in the perceptual map is difficult at best. These limitations also apply to the scaling of preference data. space. Two brands may be perceived to be similar (located close to each other in the perceptual space), yet one brand may be distinctly preferred over the other (i.e., the brands may be located apart in the preference space). These situations cannot be accounted for in internal analysis. In addition, internal analysis procedures are beset with computational difficulties.I? Discriminant analysis can also be used to develop attribute-based perceptual map of respondents against each identified discriminating function. This map facilitates marketers to identify attributes which best discriminate brands/groups in a perceptual map. Such spatial map can be obtained by plotting the brands on the basis of canonical discriminant functions evaluated at group means (group centroids) and attributes on the basis of standardized discriminant-function coefficients. Like other mapping techniques, a perceptual map drawn with the help of discriminant analysis can assist marketers in observing the complex market structure. It also helps in identifying the attribute-based positioning of groups/brands in the market and may provide an innovative insight for a new product development. However, while interpreting such map, marketers must be careful as this map provides only a partial explanation of consumers’ perception which is limited by a selected set of groups brands and attributes. interpretation of that dimension. 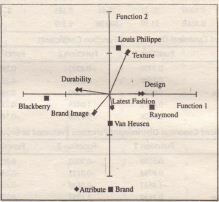 As evident from the perceptual maps in Figure 21.8 and Figure 21.9, Dimension I is characterized by design and durability, Dimension 2 is primarily characterized by texture, and Dimension 3 is characterized by brand image. Latest fashion attribute is not useful in defining any of the dimensions, as its position is not close to any dimension in both the maps. 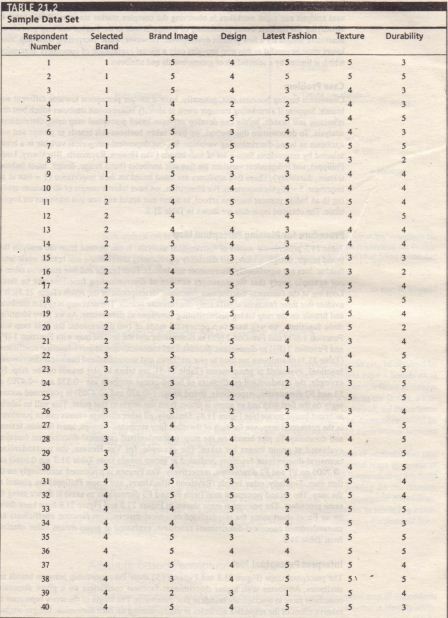 It is also evident from Table 21.3 that the latest fashion does not significantly discriminate suit brands. The attribute-brand relationship can be indicated by seeing the proximity between the attribute points and any given group (brand) centroid. Longer arrows pointing more toward a group centroid (brand on the map) represent attributes strongly associated with the brand. Attribute vectors pointing the opposite direction from a given group (brand) centroid represent lower association of-the brand 011 that attribute. 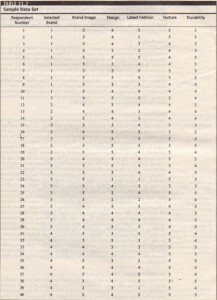 It can be noted from both the maps (Figure 21.8 and Figure 21.9) that Van Heusen scores high on F3 dimension. As Dimension 3 is primarily associated with brand image, one would expect that four brands are to be ordered on brand image in Dimension 3. Consumers who attach a higher importance on brand image would prefer Van Heusen as Van Heusen is perceived strong on brand image. 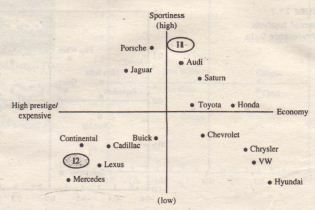 Similarly, we can observe the positioning of other brands in the perceptual map. Raymond scored high on Dimension I indicating that it is perceived strong on design. Louis Philippe seems to be stronger in Dimension 2, indicating that this brand is perceived strong on texture attribute. Blackberry scores low on all three dimensions compared to competitors. 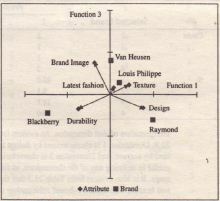 It can also be noted that both Raymond as well as Blackberry brands ‘are uniquely positioned based on the attributes on both the maps, while Louis Phillipe and Van Heusen are distinctively positioned on Figure 21.8 alone, but are closely located in Figure 21.9, indicating that some attribute-perception similarity exists between these two brands. 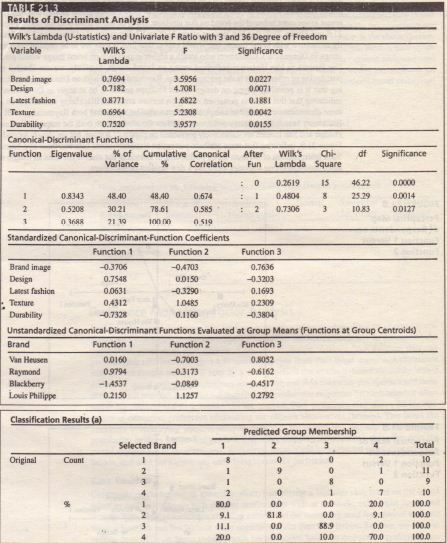 The objective of discriminant analysis is to select attributes that discriminate between brands/groups. 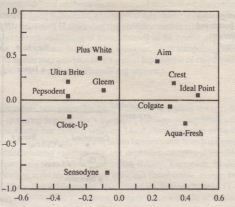 The major disadvantage of discriminant analysis-based perceptual map is that it exhibits a cluster of attributes on which brands/groups differ. In case the brands/groups are perceived to be similar with respect to an attribute (such as latest fashion in the above illustration) the attribute will not significantly discriminate brands/groups. 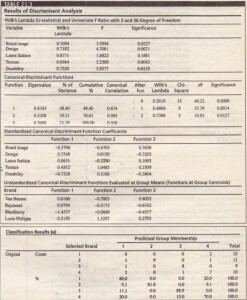 Thus, there is little scope of proper interpretation of brands/groups on such attribute in the discriminant analysis-based perceptual map. Therefore, the researcher should be careful while selecting the attributes on which the consumer’s perception will be assessed in discriminant analysis-based perceptual map. 1. Which brand of business suit did you purchase or intend to purchase? 2. How important are the following while purchasing your favorite business suit.